One of the last manufacturers of handy and popular midsize pickup trucks, Toyota has a winner in its rugged, off-road-capable 2014 Tacoma lineup. 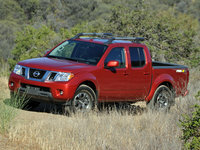 This downsized hauler, seriously challenged only by Nissan’s gussied-up Frontier, touts a couple of minor changes this year, but still offers three cab configuration: the 3-seat, 2-door Regular Cab; the 4-place, 4-door Access Cab with reverse-opening rear doors; and the 5-passenger Double-Cab, with 4 independently opening doors. A pair of bed lengths, the standard 6.1-foot bed and the Double-Cab-only 5-foot bed, are once again offered, while trim levels remain the entry-level Tacoma and the Tacoma PreRunner, both available in peppy V6 editions. 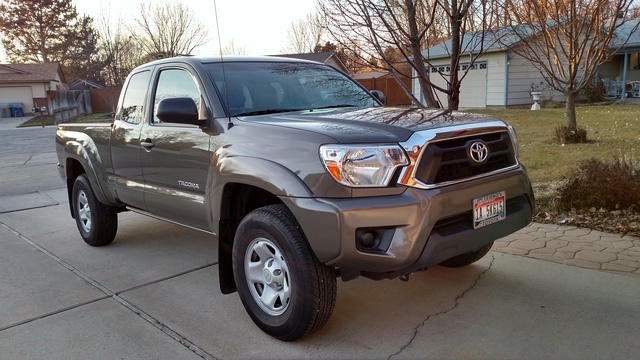 As noted, there are a couple of tweaks evident in the 2014 Tacoma stable, including a new SR Package option that begets various upgrades to interior and exterior décor, as well as upsized and upgraded wheels and tinted headlights. The street-smart Tacoma X-Runner, meantime, is deleted this year. Of course, in keeping with tradition, this downsized pickup comes in standard rear-wheel drive (RWD), while all trim/cab editions remain available with part-time, shift-on-the-fly 4-wheel drive (4WD). Said 4WD system includes hi-lo gear selection using the unique push-and-turn dial and an automatic rear limited-slip differential, as well as auto-locking hubs and available descent control. The PreRunner trim level, by the way, is offered only in the RWD configuration. Again, a pair of engines are available to this capable midsize pickup, with the standard engine in both base Tacoma and PreRunner trim levels being a variable-valve-timed (VVT) 2.7-liter inline 4-cylinder (I4) powerplant that mates with either the delivered 5-speed manual transmission or an available 4-speed automatic transmission for 159 hp and 180 lb-ft of torque. Mileage with the 4-banger is estimated at 21 mpg city/25 highway in a RWD, stick-shift-equipped version or 18/21 in a 4WD variation with the 5-speed automatic. Should a bit more oomph be needed, those trims given the V6 moniker carry a standard VVT 4.0-liter V6 engine that remains managed by either a standard 5-speed automatic transmission or an available 6-speed manual gearbox to put out 236 hp and 266 lb-ft of torque. Mileage estimates in V6-toting Tacoma trims run 17/21 for RWD 5-speed-automatic-laden editions to 16/19 in those Tacomas bearing the stick-shift and 4WD. Towing with a properly equipped V6-packing Tacoma is maxed out at 6,500 pounds. Creature comforts are sparse in the basic Regular Cab Tacoma, with 15-inch wheels and a trailer hitch among the notable appearance features, and cloth upholstery, telescoping tilt-wheel steering, simulated alloy cabin accents and air conditioning adorning the interior. A 6.1-inch touchscreen display, meanwhile, interfaces with a single-CD player with 4 speakers in Regular Cab variants and 6 speakers in Access and Double Cab versions. Again, Bluetooth hands-free calling also remains standard. Those Access Cab and Double Cab trims equipped with 4WD add on standard 16-inch wheels and skid plates, while also boasting standard power door locks and windows, a fold-flat front passenger seatback and split-folding rear seatbacks. Optional equipment, depending on trim level, engine size and drivetrain configuration, includes a sliding rear window, cruise control, remote keyless entry, a rear-view camera, TRD (Toyota Racing Division) sport- and off-road-oriented parts, graphics and badges, heated, power-adjustable sport front seats, a rear-view camera, and upsized and upgraded wheels, all of which are offered in the form of various packages. A navigation system, meantime, is available as a standalone option, as are upgraded audio components, Entune infotainment, a tow hitch, various high-end interior and exterior accents, and Toyota’s touted VIP security system. Finally, standard safety equipment of note aboard the 2014 Tacoma includes 4-wheel antilock brakes (ABS), traction and stability control, front side-mounted airbags, front, and in Access and Double Cab trims, rear head airbags, and front head restraint whiplash protection. Daytime running lights are standard aboard all Tacoma iterations, while front fog/driving lights are available lineup-wide. 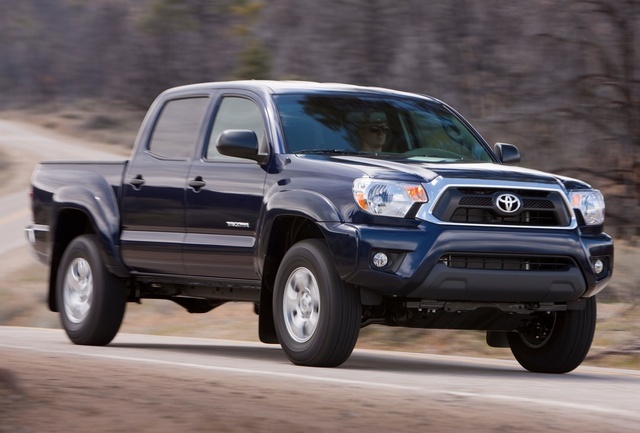 What's your take on the 2014 Toyota Tacoma? Francesco Marcelo SR5, nice smooth drive, feels like a sedan. Have you driven a 2014 Toyota Tacoma? Traveling How Far Should I Go Before Stopping To Let My Engine Cool? I’m traveling in my 2014 Toyota Tacoma, 800 miles (12hrs) today and 800 miles (12hrs) tomorrow. How far should I travel before stopping to allow my engine to cool? Can I Take The Existing OBD II Out And Replace It With A HUM OBD II?